Melvin Rodrigue is the president and CEO of the legendary Galatoire’s in New Orleans, which won the James Beard Foundation’s Outstanding Restaurant award in 2005. He was also recognized as the Louisiana Restaurant Association’s Restaurateur of the Year in 2015. 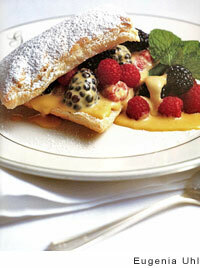 Rodrigue is the author of Galatoire’s Cookbook. Squares of delicate, crisp puff pastry are filled with strawberries, blueberries, and raspberries and topped with a creamy orange custard sauce. Crab and shrimp are served along with tomatoes, lettuce and eggs for this composed salad recipe. A Creole mustard dressing is served on the side. Named for the owner’s daughter, this recipe mixes Crabmeat with artichokes and Meunière butter. Use crawfish for a truly unique New Orleans experience.